Developmental summer bridge (DSB) programs are designed to reduce or eliminate the need for developmental education in colleges. Students with weak academic skills in math or English are offered the opportunity to participate in an intensive, accelerated program during the summer before they begin college. DSB programs are designed to build students’ skills and to increase their knowledge of, and comfort with, the college environment. Such programs are run by numerous colleges and universities in the state of Texas and have been encouraged and sometimes funded by the Texas Higher Education Coordinating Board (THECB), a partner in NCPR’s ongoing research. 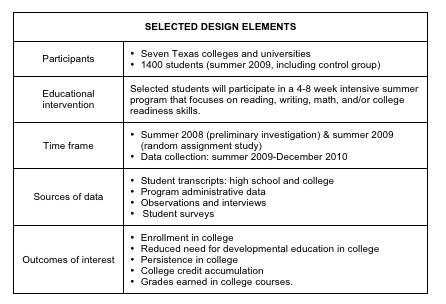 In the summer of 2009, eight Texas colleges collaborated with NCPR and the THECB to study the effectiveness of their DSB programs. Using a random assignment evaluation design, those who applied for admission were selected either for the programs or the control group. All agreed to share their college records with NCPR, allowing researchers to determine whether students who enroll in the programs do better in college subsequently than those who do not. Student outcomes are being tracked through the spring of 2011. For more information, contact: Dr. Elisabeth A. Barnett, Senior Research Associate, NCPR, Teachers College, Columbia University:barnett@tc.edu or 212-678-3719. Bridging the Gap: An Impact Study of Eight Developmental Summer Bridge Programs in Texas. By: Elisabeth A. Barnett, Rachel Hare Bork, Alexander K. Mayer, Joshua Pretlow, Heather D. Wathington, and Madeline Joy Weiss, with Evan Weissman, Jedediah Teres, and Matthew Zeidenberg (June 2012). Getting Ready for College: An Implementation and Early Impacts Study of Eight Texas Developmental Summer Bridge Programs. By: Heather D. Wathington, Elisabeth A. Barnett, Evan Weissman, Jedediah Teres, Joshua Pretlow, and Aki Nakanishi, with Matthew Zeidenberg, Madeline Joy Weiss, Alison Black, Claire Mitchell, and John Wachen (October 2011). NCPR webinar among DSB study participants on key outcomes after two years and next steps. NCPR session on college readiness. Forum looking at the question of how students can master basic skills. Three approaches are highlighted--college readiness partnerships, summer bridge programs, and learning communities--, followed by a discussion of where to invest scarce college resources. and learning communities--, followed by a discussion of where to invest scarce college resources. NCPR conference session describing developmental summer bridge programs at 8 colleges and universities in Texas. NCPR conference session focusing on the creation of state-supported developmental summer bridge programs in Texas.